These days, to say a novel is "unclassifiable" is to acknowledge the hybridity of genre definitions which has come to characterize much of contemporary literature. Writers such as Colson Whitehead, Karen Russell, Brian Evenson, and Aimee Bender have been known to challenge the traditional definitions of what literary fiction is allowed to do, and likewise with writers like Kelly Link, Jeff VanderMeer, and Karen Joy Fowler, all of whom have typically written from a more conventionally genre perspective but who have developed far beyond those earlier classifications. 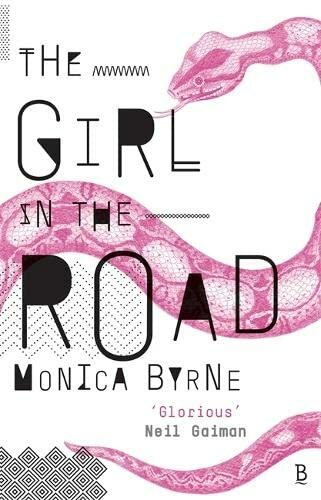 But then there are what feel like true outliers, such as Monica Byrne's debut novel The Girl in the Road , a story that satisfies none of the expectations of the genres it seems at first to merge—thriller, hard science fiction, coming-of-age, near-future dystopia—but is still, in its own unclassifiable, wholly original way, satisfying. The Girl in the Road takes us several decades in the future to a world in which "Africa is the new India, after India became the new America, after America became the new Britain, after Britain became the new Rome, after Rome became the new Egypt, after Egypt became the new Punt" (p. 106). Readers are left to investigate the relationship between these new African and Indian superpowers through the lens of two characters whose stories—told in alternating chapters and points of view—intertwine in surprising, beautiful, and heartbreaking ways. But Byrne is not a writer who holds her readers' hands throughout the reading of a novel; instead, we find ourselves suddenly unleashed inside its web of ideas, asked to learn its language as we go. So, the Trail: composed of a series of hinged segments which self-generate energy "via superconductors made of metallic hydrogen . . . [it is] a breakthrough in intelligent self-assembly on a mass scale, because every component . . . has an intelligent chip that, like a human cell, 'understands' where it goes and what it’s supposed to do and can monitor and repair itself" (p. 24)—all of which is to say that Meena now has a planned route for her otherwise impossible journey back to Ethiopia. The impossibility of getting to Ethiopia by more traditional means is due in part to the new sophistication in cloud technology, by which Meena's every movement is tracked and potentially transmitted to those who might want her dead. But this is a journey not without its own particular dangers, as Meena will soon discover. A bridge between India and Africa—Mumbai and Djibouti, to be exact—might, to a contemporary Western reader, seem an unwieldy concept. But in Byrne's imagined future, in which India and Africa have become major world powers, such a bridge is rife with cultural and historical implications. Just as Meena begins her journey on the Trail, we meet Mariama, a young girl who has escaped slavery and joined a caravan traveling across Saharan Africa toward Ethiopia—a caravan we learn is transporting metallic hydrogen, the material which will later be used to construct the Trail. Mariama's and Meena's stories at first seem to have little to do with one another, except for the fact that their journeys will both lead them ultimately to Djibouti (a telling detail, we will eventually discover). But the cross-cutting between travel narratives gives The Girl in the Road a structure that will hopefully be a familiar framework for readers finding themselves lost in what is otherwise a speculative anthropology, a rather stacked narrative confronting issues of history, technology, culture, language, gender, and sexuality. Byrne offers readers an entire (hypothetical) geopolitical network as a lens through which to see her characters and their stories—because of course a project like the building of the Trail has far-reaching economic and cultural implications, energy being a resource the possession of which always defines locations of power. The fact that Mariama's story takes place forty years before Meena's becomes clear later on, as does their relationship to one another. But in a novel of ideas, the characters can sometimes seem like mouthpieces, and Byrne doesn't always escape this pitfall in The Girl in the Road . Things can fall too neatly into place. And one can also get lost in the minutiae of a long journey. Catalogues of Meena's backpack inventory, for example—along with repetitive hallucinations and imagined dialogues with loved ones—more often than not serve only to highlight how little is actually going on. Meena is walking; Mariana's caravan is moving. The present action is simply the culmination of all that has come before, whereas the past is where the story truly lives. And the revelations we're offered from the past are what gives the present action its meaning, its drive. But telling a story so heavily reliant on flashback requires sufficient forward momentum in the present, and sometimes the dead spots here are too apparent. But when momentum lags, the richness of Byrne’s world-building is more than enough to sustain interest. Speculative fiction is certainly the umbrella under which The Girl in the Road should reside, most notably because of the way its narrative is formed. Rather than present us with character arcs which engage because of their momentum, the narrative arc here is composed of the slow reveal of exposition, a technique used to great effect by writers such as Margaret Atwood and Ursula K. Le Guin—writers who have created narrative experiences reliant on the worlds they've created not being fully known by readers early on. Questions which would yield definite answers—Where are we, and why? How did we get here, and where are we going?—are addressed in circumspect ways, with Byrne only offering pieces of the truth. We continue, then, on this journey with characters who themselves have questions about the world they find themselves in to which there might not be readily forthcoming answers. Exposition has become the drive for both character and reader: together we chip away at the world Byrne has imagined for us, trying to bring back something tangible from the dazzling chaos. A notable corollary to the experience of reading The Girl in the Road is that of language acquisition itself. In the future Byrne imagines for us, "the languages are getting all mixed up now anyway . . . How long will Amharic last before it becomes Amhindi? And the Indians don't even speak Hindi, they speak a half-English hybrid. So it'll be Amhinglish before very long" (p. 133). The fluidity of language's relationship to culture, the assemblage of half-meanings and overlapping vocabularies, speaks to Byrne's project of revealing the permeability of borders. On her journey along the Trail, Meena is equipped with a device called a glotti which translates all foreign languages into a recognizable, universal form. She comes across and interacts with multiple strangers along the road, and she also intercepts communication from sources known and unknown. All of these encounters become discernible via her glotti. The future in The Girl in the Road is thus one in which the world is unifying even as it works to pull itself apart. The hybridity of genres becomes a hybridity of cultures—a hybridity of influences. And as a white American woman raised and educated in the West but writing about a future in which global power has shifted to the East, Byrne herself offers a hybrid perspective, a projection based on an imagination willing to venture beyond its direct sphere of influence (though it will be to readers more familiar with the cultures Byrne is writing about to determine whether their representation in the novel is accurate and whether their projected conflicts ring true). What matters is whether it can be understood by readers on its own terms, and Byrne meticulously and lovingly provides a language with which we can begin to make sense of what we’ve been given in the form of this intricate, deeply resonant debut novel.